A New York City sightseeing helicopter that had plunged into the Hudson River, leaving all eight people aboard soaking wet but physically unharmed, was removed from the water on Sunday and was examined briefly by federal transportation officials. The helicopter, a Eurocopter EC-135, was on a sightseeing tour of Manhattan when it made an emergency landing in the river on Saturday. It was taken to an Army Corps of Engineers facility in Jersey City, N.J., on Sunday, said Holly Baker, a spokeswoman for the Federal Aviation Administration, which, along with the National Transportation Safety Board, is investigating the incident. 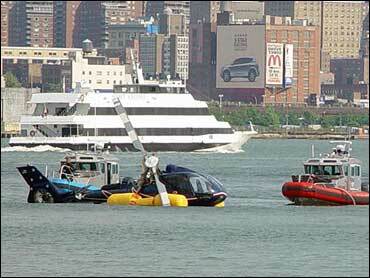 Earlier, the helicopter had been afloat on its pontoons and secured to a New Jersey pier. The NTSB said it had looked at the helicopter at the Army Corps facility and an extensive examination of it would begin Monday. It said it also had talked to the pilot, who claimed at an altitude of 500 feet she heard a loud bang and decided to bring the helicopter down and deploy its flotation devices. The flotation devices are not required equipment, but the NTSB has recommended them to the FAA for many years, an NTSB spokesman said. "In a case like this, we see the benefit of them," spokesman Ted Lopatkiewicz said. The aircraft, which did not appear to be damaged badly, was owned by Liberty Helicopters, which runs sightseeing excursions around the Statue of Liberty, Ellis Island and Manhattan. Vessels that were on the river on Saturday rescued the seven passengers and the pilot, who had donned life jackets, from the bobbing aircraft. The passengers and pilot were in the river, which separates Manhattan and New Jersey, for less than five minutes before being rescued. Passengers said it appeared the helicopter had engine trouble before it went down. One of them, Jose Mejia, praised the pilot for staying calm and for telling him and the other passengers what to do.